I had heard so much hype about The Girl and the Grove so I was eagerly waiting to read it. I was actually approved way back, but I had been swamped with other books. Well, the hype was real. And I am kicking myself for waiting so long to read it! I just need to say that this book moved me to my very core. As someone who is adopted, reading this was a breath of fresh air. While I didn’t go through the foster system like Leila, I have felt some of her exact thoughts. I’ve never been worried about being sent back – because that’s a pretty long plane ride, but I’ve had these similar thoughts about abandonment, about being broken, and about the mysterious existence of our birth parents. These parts of the book made me cry. They resonated with me in this way I didn’t expect and that was the best surprise. (I was never bullied about my ‘Other’ status as a poc or adopted kid, unlike our protagonist and her friend. For me it was the self-erasure and the way no one was talking about it that was also damaging to me. Speaking of this, I want to talk about how refreshing it was and heartwarming, to see a positive portrayal of friendship between the MC and her best friend. I don’t think we see enough books with girls supporting each other. This inspired me to be a better friend and to actively seek out more positive friendship books. I’m so over the heavily toxic relationships – as someone who has lived in one, there’s only so many I can read about). A good runner up surprise was that the plot constantly surprises you. I will not spoil this gem of a book for you, but it took everything I was expecting, proved some of it right, but improved upon in in spectacular ways. 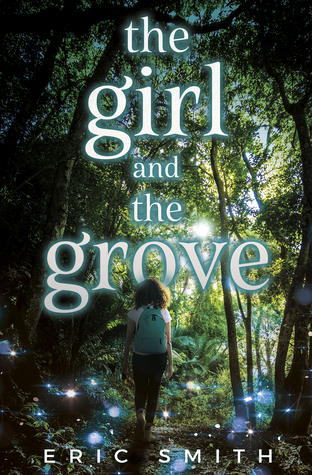 The Girl and the Grove is a book that incorporates multiple mediums – texts, forums, and text. It is refreshing and hilarious. There’s a genuine personality to not only the writing in general – which I heard only in Eric’s voice from his podcast – but the characters are so lively. They not only feel authentic, but they feel like their thoughts, their words, could be pulled from your own journals, your own chats (with some additions). Diversity wise, our main protagonists is a woman of color who is adopted and suffers from season affective disorder. It rings true with elements of #ownvoices narratives, and the whole thing feels seamlessly part of the text – part of Leila. Is it dealt with, talked about , in a natural way and it never felt heavy handed. One of the other things I loved was the activism in this book. I wish my younger self had read this and thought – yes it is so cool to be passionate about something that people might not (probably not) understand, and to go with it. I needed this role model then, and, to be honest, still need it now! It is such a great source of role model material without it being a ‘teaching’ story. It’s not. This story is genuine and it’s about Leila coming to terms with the voices, and also embracing parts of herself. The Girl and the Grove mixes genres, is integrated with pop culture references, and is purely delightful and spectacular. It made me so happy on every level to read. This book is about family – the ones we make and choose and create. At the same time, it’s about letting people in, exposing vulnerable parts of ourselves. It’s for people who have questions their whole lives, who have had to make up their own stories, and had to speak their own truths. I don’t have enough words for how much I loved The Girl and the Grove and how much it meant to me. Please go check out The Girl and the Grove on Goodreads. I also love supportive girl best friend stories. This book is on my TBR already (I just liked your review on Goodreads as more people need to read your well-thought out reviews) and now I really want to read it even more. This also sounds like an important book for school libraries to feature. Wow, you’re so kind! And yes, I thought that this book was really excellent so I hope more people read it! If you like those types of stories, UNDEAD GIRL GANG is pretty good too! The last one that made me cry, and it’s not something I do very often, was The Book Thief. On the other hand, Spike Milligan’s work makes me cry with laughter! can you believe I haven’t read that one yet? Hm. I’ve seen this guy on Twitter a lot and I’ve heard of this book. I’ve added it to my Goodreads TBR!